University of Minnesota Extension is offering four Small Grain Summer Plot Tours across MN in June and July to address small grain production issues, variety performance, and insect and disease pests. Presenters will vary by location and include Jochum Wiersma, University of Minnesota Extension Small Grain Specialist, Madeleine Smith, University of Minnesota Extension Small Grain Pathologist, Phil Glogoza, University of Minnesota Extension Educator in Crops, Jared Goplen, University of Minnesota Extension Educator in Crops, and Angie Peltier, University of Minnesota Extension Educator in Crops. 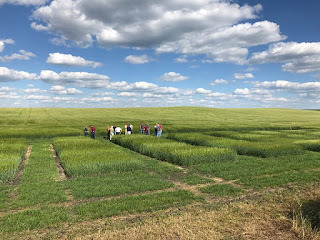 View brochures for the Northern small grains tour or Southern small grains tour. Preregistration is not required and there is no cost to attend. For more information contact Jared Goplen (320-589-1711 x2128 or gople007@umn.edu) or Jochum Wiersma (218-281-8629 or wiers002@umn.edu).